Stylish, unique and historical, Volunteer Park wedding photography in Seattle offers fantastic opportunities for outdoor wedding photos in a unique and significant setting. This happy image was taken at the nearby Volunteer Park Café where we stopped on our wedding day photo stroll for glasses of sparkling cocktails and sparkling conversation. The couple clearly volunteered their happiness for a photo and some merriment on this lovely occasion. I like how everyone is caught up in the moment, laughing and relishing the day. The pink dress and blue suits also make the bride’s beautiful white dress stand out that much more. Once upon a time in 1876, Volunteer Park was acquired by the city of Seattle for $2,000 and was later designated a cemetery. It was renamed Volunteer Park in 1901 to honor the volunteers who had served in the Spanish-American War. 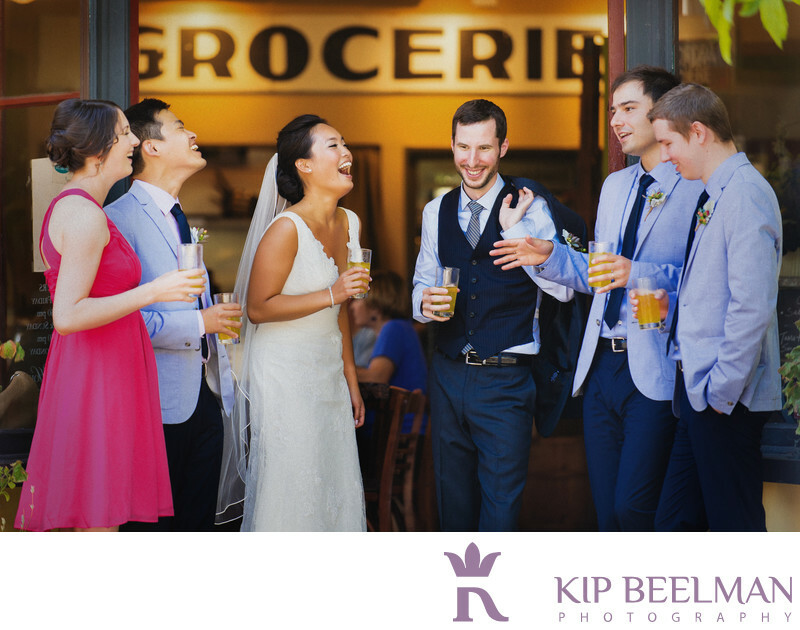 Today it includes a conservatory that is a city landmark, a water tower with a cool observation deck, the dramatic Seattle Asian Art Museum’s Art Deco building, and – clearly – a great spot for weddings and wedding photos. This couple set up in a private little grove that was flooded by sunshine for their touching ceremony. A string quartet played the beautiful interlude, processional and recessional music. After the ceremony, the day’s fun continued with a picnic and an ice cream social from a genuine ice cream truck. The reception also featured red-and-white checkered table cloths, giant pillows, and sweet and mint tea to create the perfect day for this very happy couple. Keywords: Outdoor Wedding (72), Seattle (111), Volunteer Park (3).